Ed. note: We are going to be featuring our fantastic brand ambassadors over the rest of this year, telling their stories in photos and words. Today we are profiling Mikal Wright of Pendleton, Oregon. What kind of photography do you specialize in? Photography is something that I started taking seriously about eight months ago. I purchased a drone and would go out and shoot aerial shots every chance I had. Now that I’ve purchased a DSLR camera, I’d have say portrait photography is what I’m currently shooting as much as possible. I’ve been fortunate to have a solid network of friends who are professional photographers. They have guided me along the way. Most of my shoots are in the Pacific Northwest, so you’ll see quite a bit of nature in my photography, but I’ve been challenging myself to get into the city more and shoot. What’s your dream shoot location and why (and don’t say Iceland—everyone does)? This question literally made me laugh out loud because you are so right! Out of all the beautiful places in the world, everyone wants to go to Iceland. So I will change it up and choose El Nido. It’s a Philippine town located at the most northern tip of Palawan, an island that has a coastline dotted with over 1700+ islands and islets! I’ve read that the electricity there only runs 12 hours a day, so you have no choice but to unplug and explore the beauty of the island. You scored many points for choosing somewhere original, Mikal. Where does your affinity for heritage brands come from? First and foremost, I was born and raised in Pendleton, Oregon. From my earliest childhood, I remember going to my grandparents home and falling in love with the blankets hanging on their living room walls. Fast forward to the present, I’m now working for the company that I grew up loving! There’s something extremely special about Pendleton, the fact that it’s constantly evolving as a brand even after being around for over 100 years is amazing. That helped pave the way for my brand affinity. Its also shaped the way I go about my photography. I definitely consider Pendleton as “The Outdoor Lifestyle of America” but I also see Pendleton as a high-end fashion brand. We agree, and we love your photos that show this side of Pendleton. 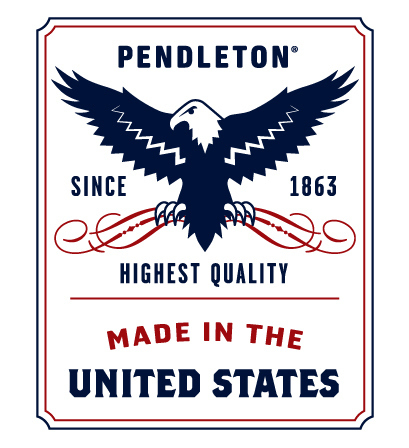 Growing up in Pendleton, and working for Pendleton, we wonder if you you have any family stories about Pendleton? There’s one story that sticks with me the most. I was in the 7th grade and my family and I were heading back home after visiting my aunt and uncle in La Grande, Oregon. I remember there being a lot of snow that winter. The roads were extremely icy. A few cars ahead of us, a man lost control of his vehicle and flipped sideways into a ditch. My dad and a few other cars immediately pulled over to see if he was okay. My dad was always prepared for emergencies, and he kept an old Pendleton Camp blanket in the trunk of the car, which he gave to the man to keep warm until the ambulance arrived. I remember telling all of my friends at school the next day, “If it wasn’t for my dad’s old blanket that guy would have froze to death.” So I’d like to think that our Pendleton blanket saved a mans life that day. Your brand ambassador work comes from a unique place—you are actually a Pendleton team member. What do you want to say about the brand with your shots? Each and every day, I have the opportunity to communicate with our consumers on a personal level. I get to hear their thoughts and I also have the chance to keep them informed and up-to-date with what we’re doing as a company. In return, I get a sense that they feel more involved and invested in our brand. I think the best artists and photographers create work that is a reflection of who they are. Pendleton is who I am and I truly hope that when people see my images they feel a sense of authenticity. This brand also has so much history and with every photo I take I want to make sure that every garment that I’m photographing is presented in a way that when people see it they know automatically that it’s a Pendleton, a brand that’s iconic in so many ways. Please enjoy this movie by Mikal, featuring his muse and model, @brandyisthecatsmeow . What is virgin wool? And is it better than recycled wool? Here at Pendleton, we use pure virgin wool for our famous blankets and shirts – but what is virgin wool, and why does that matter? Keep reading to learn the difference between virgin and recycled wool and what each is best for. Virgin wool is simply wool that’s never been used before–but that difference matters. It’s better than recycled wool because it’s stronger and higher quality. Pure virgin wool is naturally breathable in both cold and warm weather, water-repellent, durable and insulating. It also resists wrinkles, stains and odors. Even though you can dry-clean wool shirts, many people simply hang them up and let them air out, finding that to be just as effective. Since virgin wool fibers haven’t been shredded like recycled wool, they’re more resilient—they don’t break or wrinkle as easily and can provide more stretch. A shirt made of virgin wool can last for decades—some Pendleton customers pass down their Board Shirts through several generations. Not something you can say about cotton or synthetic materials, right? You wouldn’t necessarily think of wool in the same category as paper bags, aluminum cans and plastic bottles, but like those three, it’s recyclable. Recycled wool got a burst of popularity during World War II, when fabrics were rationed because wool was needed for military uniforms. As a result, civilians would recycle wool blankets into coats, or use the yarn from wool socks to knit sweaters. Very resourceful, right? Recycled wool is also called “reclaimed wool” or “shoddy wool.” Recycled wool is exactly what it sounds like: wool that’s been used to make one product, then used to make something else. Recycled wool is great for insulation, cloth diaper covers, DIY rugs, polishing metal, applying wood stain, absorbing spills and more. However, recycled wool isn’t the best for clothing and blankets if softness is your goal. To recycle wool, the fibers are torn apart and respun, which lowers the quality. Recycled wool can be “a little more harsh or fuzzy,” explains a wool crafting site. Adds one yarn site, “Most recycled wool goods have a harsh feel to them.” At Pendleton, our goal is soft, premium wool clothing and blankets, which is why we exclusively use pure virgin wool. Today, companies are legally required by the Federal Trade Commission to specify if wool is recycled. So if a wool garment isn’t specified as virgin or recycled, it’s probably virgin wool. Now the next time someone wonders, “What is virgin wool?” you’ll know the answer! For pure virgin wool blankets, clothing and accessories designed to last for decades, shop Pendleton at pendleton-usa.com. We’re so excited to present the first issue of WOVEN , our Pendleton lifestyle magazine, celebrating winter, wool, and the romance of Pendleton. We launched the print version last week at the Outdoor Retailer trade show, where it was received with enthusiasm. In the online version, there are links to stories and our Pendleton Threads podcast. Ready for a terrifying tale of winter survival? Click the link. Curious about where the money we raised for the National Park Foundation is going? There’s a link for that, too. With gorgeous photography by brand ambassadors including Brandon Burk, Shondina Lee, our #pendle10park explorers and more, WOVEN is a feast for the eyes. We are closing out this fantastic year of celebration with some more national Park memories. These two memories come from Pendleton employees. Although I don’t remember this, it is a popular story at family get gatherings. This is a picture of me at the Grand Canyon with my mother (Nancy) and aunt (JoAnn). I am recovering from a massive tantrum because my mother would not release me from her toddler hiking backpack. I really wanted to cross the guard rail to get a better look at the Grand Canyon! Obviously my request was not met and I went into a hysterical crying tantrum. Timberline Lodge on Mount Hood: The year was 1957, I was 4.5 years old. I was visiting my West coast grandparents from New York with my New York City grandmother, Rose Raskin in the Pendleton 49’er jacket, my mother, Mary Bonetta, and little sister Hillary, age 2. I recall only the gift shop, where I was to receive a totem pole. Who knew then I would work for Pendleton 45+ years later. Wish I had that 49’er jacket! Two wonderful memories, two fabulous photos and two babies for the New Year. Happy New Year from Pendleton Woolen Mills! We were delighted to see French actress Isabelle Huppert in the New York Times style magazine, wearing our Frankie shirt. Huppert is known for her intelligence, beauty and insistence on challenging roles. Her career spans 45 years and over 100 roles. Black Friday can be overwhelming—it’s a mad rush to stock up on gifts and fight the crowds before you collapse at home for leftovers and napping. To make things a little easier, here are top 10 picks to grab this Black Friday, from hot new arrivals to time-tested bestsellers. Click the name to shop these items at pendleton-usa.com – and check out our amazing Black Friday deals! Chances are, you know a Marvel fan, and our newest blanket is the one they want. (Prefer Star Wars? You’re all set too.) This wool blanket is naturally warm and resists stains and odors, plus it’s made in America. Steve Rogers would approve. This is the bathrobe they’ll love for the rest of their lives. If you think that’s an exaggeration, customer Patricia51 writes, “This robe is so wonderful, warm, cuddly, and well made. I truly will never need to buy another, ever.” Pendleton’s exclusive Whisperwool pure virgin wool is not only supersoft, light and warm; it’s also machine washable, so crumbs and spills are nothing to worry about. Technically this is “loungewear,” but several Pendleton employees wear this at the office. and it’s so cozy (plus there’s an eye-catching Pendleton pattern on the back and sleeves). It’s basically a hoodie you can wear to work. Genius! If “wool shirt” makes you think “thick and scratchy,” this shirt will change your mind. It’s refined and lightweight, woven of an entire mile of smooth worsted merino wool yarn. One happy customer says he owns a dozen of them! Can anything beat merino wool socks? They keep your feet happy and dry, they never get terribly smelly and they’re light and breathable enough to wear all year. Try this new knee-high version in our popular Harding pattern, or go with unisex patterned crew socks to make workdays more lively. Can’t get enough? There’s more here, here and here. If “machine washable” seems to be an unofficial theme, it continues with our Eco-Wise Wool® blankets. (Who has time for dry cleaning, especially during the holidays?) In both solids and plaids, they’re some of Pendleton’s bestsellers: made in America, softer with every wash and Cradle to Cradle certified eco-friendly. You can even get them monogrammed. Wish you (or she) could wear a Pendleton blanket? Now you can. Our warm, blanket-weight fabric also goes into this luxurious, popular jacket in versatile black and ivory. As seen in the cult classic movie The Big Lebowski, this is Pendleton’s bestselling men’s sweater, also beloved by women and dogs. Even if you aren’t a fan of The Dude, the unusual, distinctive design is stylish enough on its own. It’s well-constructed of toasty lambswool and sure to be a cold-weather favorite. Get one before it sells out again! Pendleton’s softest, most luxurious throw blanket in an incredibly popular pattern. This is the one they’ll love wrapping up in on cold nights or snuggling under on the couch. The fine merino wool is brushed for a cozy feel, and the simple bands of color match almost anything. Our #1 Heritage product. Guys love it. Women do too (and there’s finally one for them!). This must-have has been seen everywhere from a Beach Boys album cover to rockstars, celebrities, outdoor enthusiasts and anyone who likes to be warm and stylish. For the uninitiated, Pendleton’s rugged Umatilla wool is breathable and resists stains, wrinkles, odors and even rain, and the colors will stay true. Plus, it’ll last for decades. Perfect gift! What will you be buying this Black Friday (if anything)? Happy shopping! As part of native American History Month, we’d like to look back at a favorite blanket, Code Talkers (retired in 2012), which honors the exceptional valor and service of Navajo Code Talkers during WWII. The Code Talkers developed a code that could not be cracked, based on the Navajo language. The (now retired) design shows the Navajo words and their coded meanings, which remained impenetrable to German code-breakers throughout the war. The history of the code talkers is more riveting than any film or any fiction. You can learn more at their official site, and at other sites that tell this fascinating story, which was told in the popular movie “Windtalkers”. They don’t have a Pendleton blanket, but the Choctaw Code Talkers of WWI deserve recognition for their role. This small group of Choctaw soldiers conveyed crucial information over tapped phone lines. You can read more about them here, and see a full list of their names. 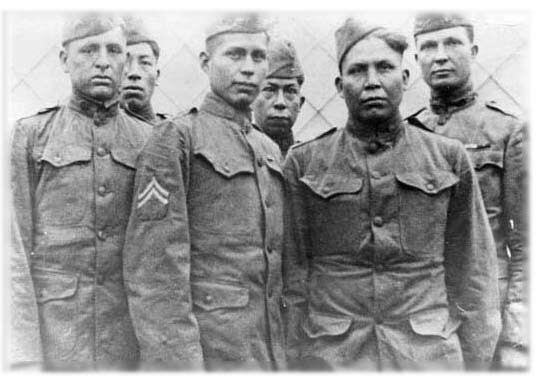 It is worth noting that these Native American soldiers fought for the USA before they were even granted official citizenship in 1924. 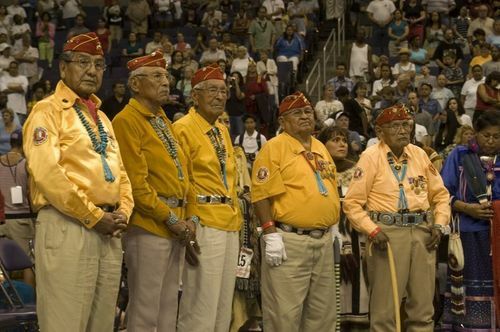 In the year 2008, the United Sates Senate and House of Representatives passed legislation to recognize Code Talkers from several nations: Navajo, Choctaw, Comanche and more. 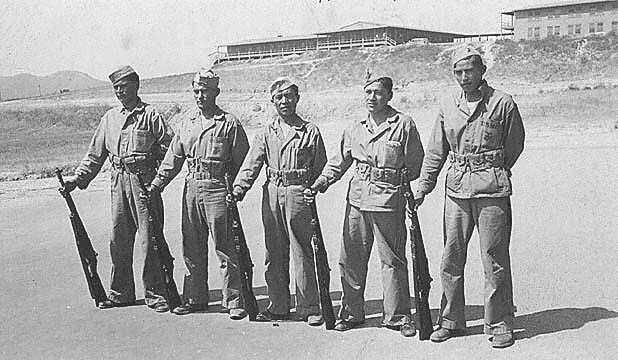 As the years march on, there are fewer Code Talkers to honor, but these heroes will not be forgotten. 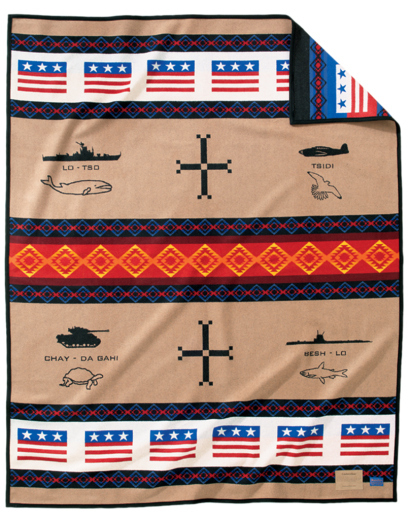 Though Code talkers is no longer available, the Brave Star blanket celebrates the patriotism and military service of Native Americans. This contemporary interpretation of the American flag is a celebration of the patriotism of Native Americans. In 1875 Indian scouts carried messages from fort to fort in the West. Native American soldiers saw action with Teddy Roosevelt’s Rough Riders in Cuba. And soldiers from many tribes battled in World War II, Korea, Vietnam, the Persian Gulf and Iraq. Five Native Americans have been awarded the Medal of Honor for bravery “above and beyond the call of duty.” The design marries modern asymmetry and vintage Americana. The unique striations, using pulled out yarns, reflect an era when dyes were made from plants. We’re proud to show off our newest collaboration with Kitsbow: the Icon shirt for 2016. This shirt is a marriage of wool, Nature’s first technical fabric, with Schoeller 3X Dry panels. This shirt happens to be Men’s Journal‘s pick for best cycling shirt. Just a note, here. Kitsbow chooses the fabrics for these shirts. It never fails that when presented with the full array of our Umatilla wool plaids, they choose the very best of the classic Pendleton plaids. So go see the full selection. Thanks to Kitsbow for all photography. Now get out there and ride! This authentic Navajo rug is being offered by Pendleton Woolen Mills in support of Utah’s Adopt-a-Native-Elder program. This outreach program helps Navajo elders, as they carry on the oldest cultural and spiritual traditions of the Dine People. Many elders are located in remote areas, living in hogans and raising sheep. The program provides food, clothing, fabrics, yarns and other needs. In return, the Elders share their expertise, especially in weaving. For this project, Pendleton donated bales of dyed virgin wool, which ANE volunteers divided into bags and distributed after an Adopt-a-Native-Elder dinner. The Grandmothers were invited to choose their own wool, and were quite enthusiastic to be involved. The weavers returned fifteen completed rugs for judging. From a host of beautiful entries, this rug was the winner. It was woven by Gloria Hardy with assistance from her mother, Louise. It is spun and woven from 100% Pendleton wool. Mother Louise spun the wool, and daughter Gloria designed the pattern and did the weaving. The size is impressive (48″ x 46″), and it is a beautiful pattern. The stripes in the pattern represent the calm and steady wind of the desert sky. The crosses represent the Prayer of the Four Directions: I pray with beauty before me, behind me, above me and all around me. May I walk in beauty. This rug is one-of-a-kind, authentically Navajo, and is being offered to support the fine work of Adopt-a-Native-Elder. Pendleton is proud to support Adopt-a-Native-Elder. Color can make all the difference. And let’s be honest — it’s a fine line to walk when choosing a palette that is both current and will stand the test of time. Is it any wonder then why mid-century colors resonate so strongly with us? Bold, vibrant shades of cobalt blue juxtaposed with neutral gradients of grey, both accented with a splash of canary yellow — this was a palette we chose for our second collaboration with the fine folks at Pendleton. And when these colorful fibers are woven into a premium, heavyweight wool blanket, the result is something you’ll be hard-pressed to put away when summer comes. We are crazy about this collaborative run of throw and pillow. They are definitely #WorthHoldingOnto . Reversing the throw gives a completely new look. That’s one of the advantages of jacquard loom weaving; the versatility from front to back. And speaking of jacquard looms, do go read the post on the Tanner crew’s visit to our mill to see their fabric in production. The photography is absolutely beautiful! See it here: Inside the Pendleton Mill with Tanner Goods.